Saturday will see Ballymore Stables representative, Margin Trader (pictured), step out in what will be one of the hottest three-year-old fields in recent years - the Group 1 TV3 New Zealand Derby over 2400m at Ellerslie. A striking son of up and coming sire Tavistock, Margin Trader has trained on extremely well following his tough ninth placed effort in the Group 2 Avondale Guineas earlier this month and is looking the part ahead of this weekend’s assignment. 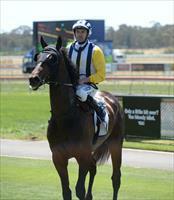 “You have to put a line through his last run,” co-trainer Chad Ormsby said. Margin Trader has drawn nicely in barrier five and will have the riding services of Rhys Mcleod who has been called in from Australia to take the mount. The 2400m should be ideal for Margin Trader and if he is granted a cosy time throughout the run, there is a good chance he will be giving the field a decent shake at the business end of the race.